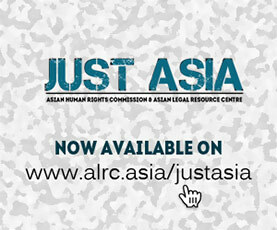 The Asian Human Rights Commission (AHRC) has received information that officers of the law enforcement agencies abducted a young activist who was tortured to death in illegal detention. After the incident officers of these agencies threw the tortured and bullet riddled death body near the Bharia Road City Railway Station of District Naushero Feroz of Sindh Province. They also scattered some weapons near his dead body to give the appearance that his death was due to an encounter as well as to make him look like a terrorist. The agencies officers then started intimidating the victim’s brothers not to reveal the incident and were also warned not to register a case against them. They were told that many false cases would be registered against them. Mr. Sahib Khan Ghoto (40), a resident of village Jalal Ghoto, Taluka and District Ghotki, Province Sindh was tortured to death in the custody of law enforcement agencies during his illegal detention of three days. (warning to the reader: the photo of the deceased victim is graphic and may not be suitable for all viewers: http://www.humanrights.asia/news/urgent-appeals/images/2014/ahrc-uac-021-2014.01). Sahib Khan, son of Mr. Dhani Bux was a political activist, nationalist and central member of the Executive Committee of Shehri Etihad (Citizens Unity) Ghotki. Shehri Etihad is a organization working in Ghotki for the people and in this organization all Non- Governmental Organizations, political parties and the civil societies of the Ghotki District are collectively working together.He was also the president of Jiye Sindh MutthahidaMahaz (JSSM) a nationalist party,Ghotki District. On 14 February Sahib Khan Ghoto along with his brothers, Mr. IsrarAhmed Ghoto and Mr. Naveed Ahmed Ghoto were returning home after a hearing in the anti-terrorism Court, Sukkur at around 12.30 p.m. On the way to home their vehicle was stopped near the Navy Park Rohri. They were stopped by officers of the intelligence agencies and other staff who were in civilian dress. They had arrived in a mirrored double cabin and and were waiting for Sahib Khan. According to statement of the brothers, when Sahib Khan stopped his vehicle perpetrators asked for their identities, following which he and his brothers introduced themselves. After the introduction one officer disclosed his identity and told them he was Mr. Colonel Ali the In-charge officer of the Inter-Service Intelligence (ISI) Sukkur region. After learning of his identity the Ghoto Brothers protested against the illegal act of stopping them on the road. However, the ISI officer along with his men took Sahib Khan forcibly and put him in their Double Cabin Vehicle and went away to unknown place leaving behind Naveed and Israr. They were both warned not try to register a complaint against the abduction of Sahib Khan otherwise they will bear bitter consequence with false charges and the death body of their brother Sahib Khan. On the next day, 15 February, the Ghoto Brothers published the news of their bother’s abduction by law enforcement agencies in local newspapers. When civil society and party members came to know about his abduction a number of protests were held in different cities of Sindh province demanding the safe recovery of Sahib Khan. They requested the SSP Sukkur and SHO of Rohri District Sukkur to take action against the culprits but they did not respond. An All Parties Conference was held at Ghotki in connection to the incident to raise their voices against the illegal detention of Mr. Sahib Khan Ghoto by establishing a Hunger Strike Camp at the Press Club Ghotki. On 18 February the brothers received the news that the mutilated body of Sahib Khan Ghoto had been dumped near the Railway Station Bharia Road District Naushero Feroz and instantly went to collect it. Sahib Khan was buried in his home town where thousands of people from every walk of life attended. They put the body of Sahib Khan on the national high way and chanted slogans of freedom and demanded justice for the martyr. The spy agencies had tried to abduct Mr. Sahib Khan a few times before as he was a brave member of a nationalist party who demanded freedom for the Sindhi people. His thoughts and ideology provoked and challenged the spy agencies and the agencies considered him as a danger for them. They sued false charges against him calling him a terrorist as they did not want to see him working freely and creating challenges for them. In 2010 some terrorist attacks were made in Ghotki targeting the railway tracks. The case was registered against some people and the name of Sahib Khan was one of them. Before registering case against him, he was arrested from a hotel of Ghotki town where he was taking tea with his friends. After 8 months of imprisonment in that case he was released on bail. In November 2013 he was once again arrested by Ghotki Police which kept him in lock up. After imprisonment of more than one month he was released from District Jail Ghotki on bail. In 2010 When Sahib Khan was arrested and the police were going to transfer him to an unknown place on the demand of the agencies the people and party member’s outburst on such brutal acts prevented his transfer. They demanded his release from jail and with the efforts of Shehri Etihad and JSSM he was released on bail from the jail but the case was still going on in Anti-Terrorism Court Sukkur. A huge number of people have been abducted, tortured and killed by the agencies. The nationalist party JSSM was banned by government a few times in the past. Different allegations were put against the party and number of people were abducted and killed; still many people are missing. The state agencies are against such secular parties because of their moment for freedom and secular state. The petition was registered against the abduction of Sahib Khan in High Court of Sindh Bench Sukkur by his brother and the hearing was to be held on 25 February 2014, but he was killed in custody beforehand. Please write a letter to the following authorities, calling on them to initiate a judicial inquiry into the murder of Sahib Khan in the detention of spy agencies. Please also urge them to prosecute the high-ranking officials from ISI and Rohri police station for killing a person by torture in custody. The government must also ensure the security and safety of the victims’ family members who are under threats from the perpetrators and has to provide the compensation to the family. The AHRC is writing a separate letter to the UN Special Rapporteurs on Torture and Other Cruel, Inhuman or Degrading Treatment or Punishment and Special Rapporteur on Extra-judicial, Summary, or Arbitrary Executions. Name of victims: Mr. Sahib Khan Ghoto, S/O Mr. Dhani Bux resident of village Jalal Ghoto, Taluka and District Ghotki, Province Sindh, Pakistan, and his brothers who are under threat: Mr. Israr Ahmed and Mr. Naveed Ahmed. Names of alleged perpetrators: Mr. Colonel Ali In charge of Inter-Service Intelligence (ISI) Sukkur region Sindh Province, PAKISTAN & others. Place of incident: Near Bharia Road Railway Station, NosheroFeroz, Sindh Province. I am writing to voice my deep concern regarding illegal arrest, detention, torture and extrajudicial killing of Mr. Sahib Khan Ghoto (40). Sahib Khan was a resident of village Jalal Ghoto, Taluka and District Ghotki, Province Sindh. He was tortured to death in the custody of the law enforcement agencies during his illegal detention of three days. I am informed that Sahib Khan, son of Mr. Dhani Bux was a political activist, nationalist and central member of the Executive Committee of Shehri Etihad (Citizens Unity) Ghotki. Shehri Etihad is a organization working in Ghotki for the people and in this organization all Non- Governmental Organizations, political parties and the civil societies of the Ghotki District are collectively working together.He was also the president of Jiye Sindh MutthahidaMahaz (JSSM) a nationalist party,Ghotki District. After learning of his identity the Ghoto Brothers protested against the illegal act of stopping them on the road. However, the ISI officer along with his men took Sahib Khan forcibly and put him in their Double Cabin Vehicle and went away to unknown place leaving behind Naveed and Israr. I am appalled to learn that they were both warned not try to register a complaint against the abduction of Sahib Khan otherwise they will bear bitter consequence with false charges and the death body of their brother Sahib Khan. I call upon the authorities to instigate an immediate investigation into the illegal arrest, detention, torture and extrajudicial killing of Mr. Sahib Khan Ghoto. The officers concerned must be brought to justice and prosecuted under the laws of Pakistan. The family of the deceased victim must be compensated for his loss and ensured of protection against the agencies of the state which take the law into their own hands.